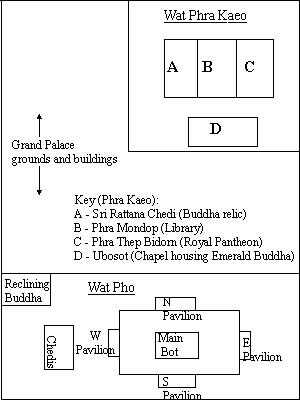 Phra Kaeo (or Kaew), the temple complex that houses the Emerald Buddha, is located on the grounds of the Grand Palace in Bangkok (map). It was built by Rama I in 1782, when he built his capitol at Bangkok. Colossal guardians (closeup) flank the east entrances, overlooking the interior of the complex  an unusual placement, which may suggest protecting the temple from internal disturbance rather than from external dangers.